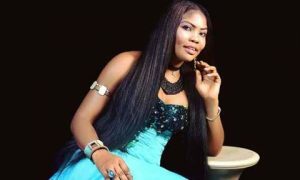 Sultry actress, Ginah Mensah, who plies her trade both in Nigeria and Ghana has sensationally declared to this writer that Ghanaians are better film makers than their Nigerian counterparts, even as she declared that the Nigerian movie industry famously Known as Nollywood remains the poster child of African cinema. Gina who has acted in a handful of movies like, “Night Nurses,” “The Prostitute” began her professional career in Nigeria and remains grateful for the opportunity but is not ready to be sentimental because according to her it is only critical criticism that will push African cinema forward. “If not for the Nigeria movie industry, I will not be what I am today, because when I decided to start my career in Nigeria I knew this was the best place that can nurture my career to its fullness and it really worked because when I step into Ghana today I am looked at as a mega star because of Nollywood ratings. But when I started getting scripts to work in Ghana, I discovered that a large percentage of Ghanaian movie producer and directors pay more attention to details than Nigerian producers, hence my submission that Ghanaians are now better than Nigerians, and I am saying this for the good of African cinema not because I am a Ghanaian. The truth is we still have a few Nigerians who have ensured Nigeria stays at number one in Africa…” like who? “That is surely a no brainer, Tunde Kelani, Kunle Afolayan, Kemi Adetiba and a host of other”. What is that one event that made Gina that feel she is truly on her way to the top and which has been her most embarrassing so far? “wow, I just got back from Port Harcourt were I had gone to shoot a movie, and in my hotel this elderly man approached me and started telling me how he adored me and how I am a good actress, before I could say thank you, he had pushed three hundred and fifty thousand naira into my hands. “For my most embarrassing moment, I live in Ikeja, then there was a day my phone had issues and I did not feel like driving to computer village or paying for a cab because I do not want to change my regular life just because my face is on television, so I decided to take public transport to fix my phone. When I got to Ikeja buss top this group of girls started screaming and pointing at me. They kept saying ‘its Gina what is she doing her tracking, I felt like the ground should swallow me.” She concluded.